An ingenious invention by a Cornish child that enables him to spy on his friends from the sky is in the running for a top honour. 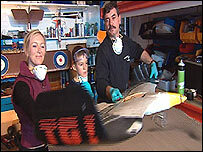 Robert Newcombe, 10, from Truro, designed the so-called spybird by disguising a radio-controlled aircraft as a seagull made out of balsa wood. A video camera was fitted inside. Robert will demonstrate his creation on a BBC One programme called That's Genius! on Wednesday. He is one of five finalists chosen from 3,000 entries. It all started with Robert's fascination with the gadgets used by James Bond. Robert thought he would try to come up with his own piece of spying equipment to enter in the BBC TV competition. He said: "I thought it was a good idea as I liked James Bond so I was thinking about what gadget I could do when I saw a bird fly by. "Then I thought I could spy on people in a bird, so why don't I make a remote-controlled bird with a camera." Robert's dad, Dave, said: "Robert was busy sketching on bits of paper for several days. Eventually he came up with a sketch which he handed over to me and asked me to put in the post and send it off to the BBC. "I thought that would be the last we would hear of it because there would be so many entries." Spybird was built at a workshop near Plymouth from Robert's design. Pictures from the camera concealed inside can be watched on a screen on the hand-held control unit. Spybird has a 6ft wingspan and can remain airborne for 10 minutes. Viewers will vote for their favourite of the short-listed inventions and the winner will be announced on 17 December. "I like James Bond quite a bit"